Our commitment to excellence continues to advance as the industry changes. 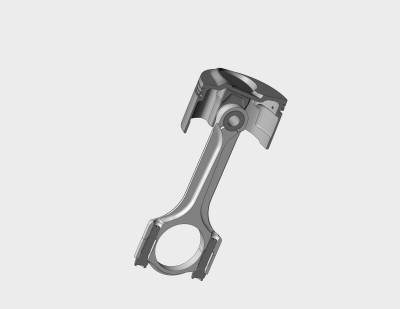 Thiscommitment has resulted in more forgings specific to certain applications, proprietary treated wrist pins and rings manufactured only for us. Each of these aspects has been put through stringent research and development stages to ensure that our product will exceed your standards. Our staff is committed to your success through technical support and accountmaintenance. All of our sales staff are equipped with comprehensive information from piston specs to applications, and are committed to grow our business in a positive and professional manner so that your business can do the same. 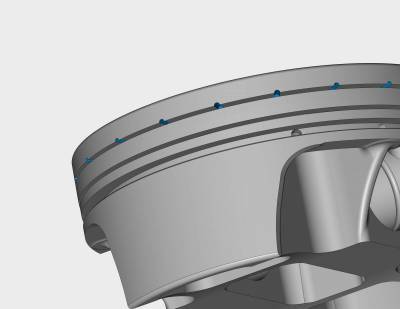 Accumulator Groove V-shaped groove machined in the 2nd ring land that adds to the volume between the top and second ring. 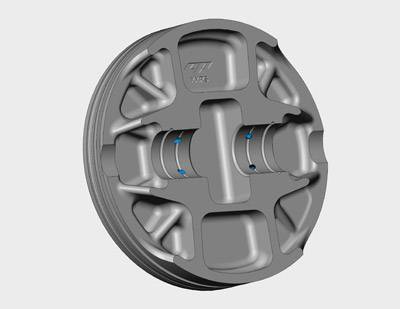 This groove accumulates residual gasses from combustion which alleviates top ring flutter and premature second ring wear, improving ring seal. 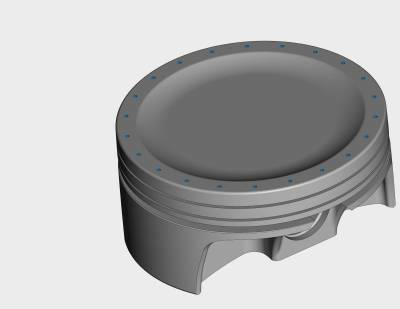 Anti Detonation Grooves (Contact Reduction Grooves) Also know as contact reduction grooves, which limit the piston/cylinder contact during high temperature and high RPM. These grooves also protect the top ring by disrupting detonation waves. Broaches Broaches are horizontal slots in the pinbore designed to allow oil to enter between the wristpin and pinbore. 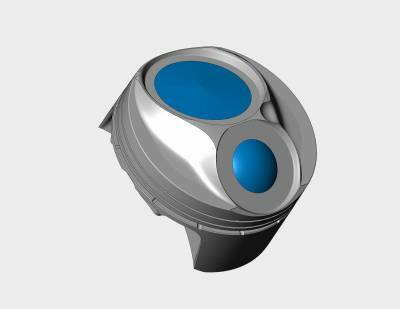 Broaches are also used to accommodate the wristpin shape under compression, as it can become somewhat oval and needs room in order to alleviate galling. Clip Cuts Additional cuts that are on the edge of the piston (generally near the valve reliefs) and used to deburr or un-shroud the valves while still on the CNC machine. 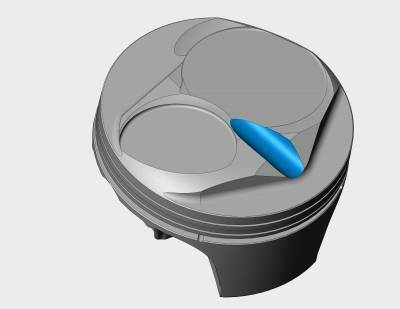 Combustion Trough A term used to describe a feature on the piston crown between the intake and exhaust. 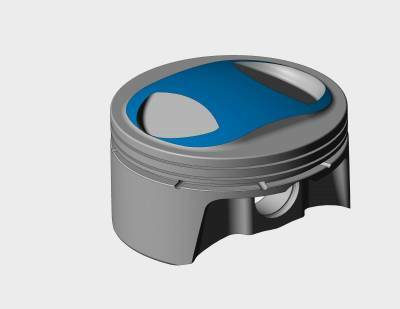 Ignited air/fuel mixture on flat top and dish pistons typically have better flame travel than a dome piston. 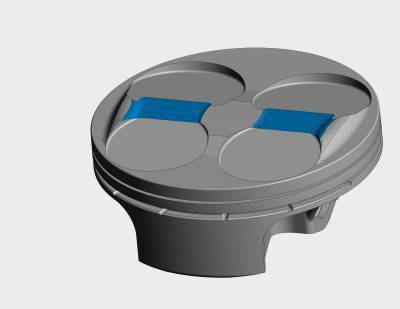 Flame travel on dome pistons can be improved with “fire slots” and/or a combustion trough. CP Groove CP Groove stands for Constant Pressure Groove. This groove is a channel on the lower part of the top land and equalizes pressure to the top ring groove. When used in combination with lateral gas ports, the CP groove helps keep gas ports clear of carbon build up. 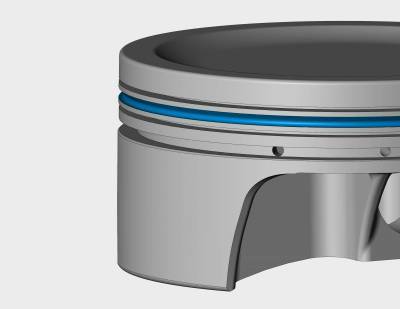 In addition, the CP groove prevents the top land from smearing into the top ring if the land rubs the cylinder bore. 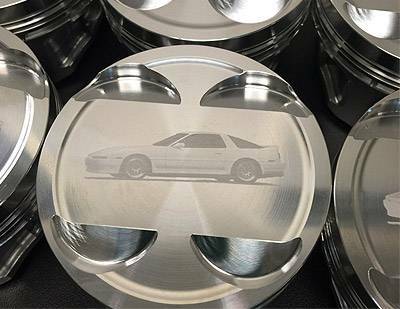 Custom laser logo/Serialization CP-Carrillo offers custom laser marking such as serialization, bar-coding, text, including any TrueType font, alphanumeric serial numbers, data codes, logos, part numbers, graphics, and data matrix codes. Double Pin Oilers Double Pin Oilers (opposed to single pin oilers), in conjunction with our annular reservoir, can add twice the amount of oil from the cylinder wall to the wristpin bore. 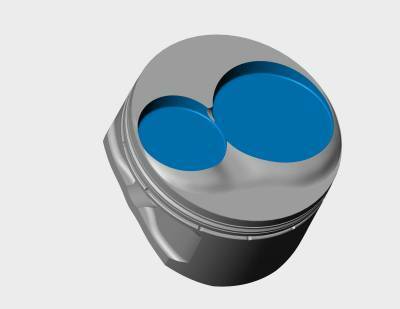 This is a standard option on any piston that receives forced pin oiling. 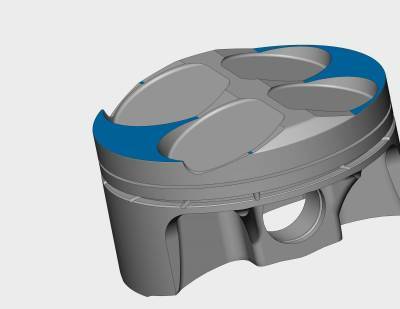 Kellered Dome/ 3D Crown Machining Special engineering and manufacturing processes that matches the piston crown precisely to the cylinder head to get max compression when needed. This can also be used to regenerate a hand massaged piston crown on the CNC for ease of duplication. 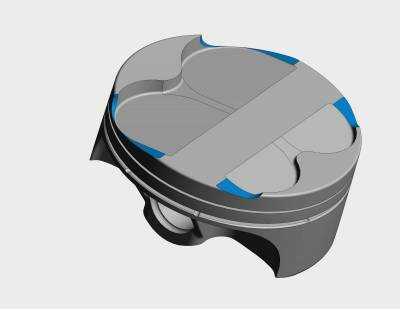 Lateral Gasports Lateral gas ports are horizontal slots in the top of the top ring groove and they provide a passage for combustion pressure to get behind and above the top ring, increasing ring seal with reduced radial rings. Lateral gasports are often used over the vertical option when carbon build up (which could clog vertical gasports) may be an issue. 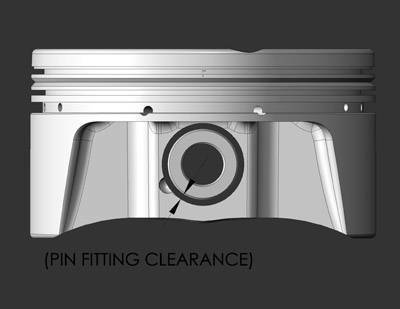 Pin Fitting The pin bore is precision honed to attain an exact pin clearance. Depending on the application clearances typically range from .0003 to as much as .003 between the wristpin and bore. 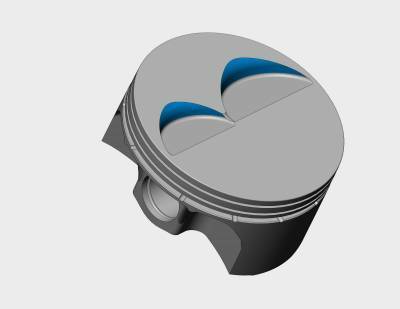 Piston and Rod Combination optimization CP-Carrillo coordinates piston-rod designs and specifications to allow these parts to integrate precisely and match the customer’s intended usage. This is an advantage that virtually no other piston or connecting rod manufacture can claim. Plug Reliefs and Fire Slots Various machined slots and reliefs that are used to promote clearance for the spark plug. 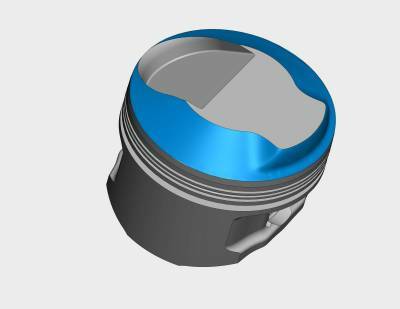 The plug relief is generally a plunged ball end mill, where the fire slot is a trough in the piston that helps move the spark towards the exhaust side of the chamber. Plunge Pocket(s) Valve reliefs that are machined in a plunged or circular fashion, designed to leave a boundary around the perimeter to achieve higher compression. 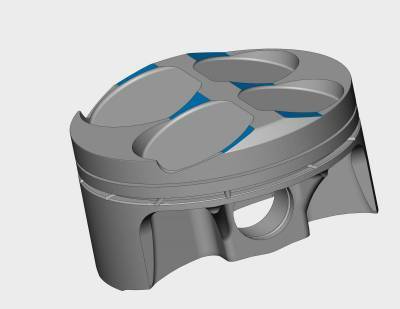 Radius Domes Used to maximize quench while eliminating possible hot spots that promote detonation, radius domes also allow the piston to yield better flame travel. Radius Valve Reliefs A Radius valve relief is created by using a form tool (or done in a 3D fashion) to roll the edge of the valve relief. 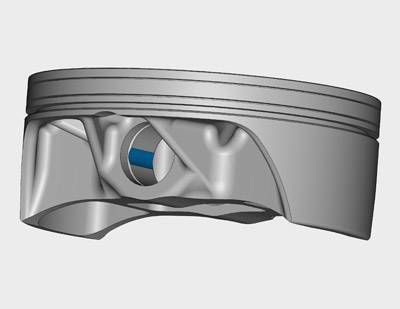 Often times we generate radii from valve relief to valve relief (see VR Sweep) as well and this is used to improve flame travel and cross flow in the combustion chamber during the overlap stroke. Slant Cuts Cuts that are used over the valve reliefs in order to un-shroud the area around the valve. Straight Cuts Cuts that are used to create the deck surface on a piston. 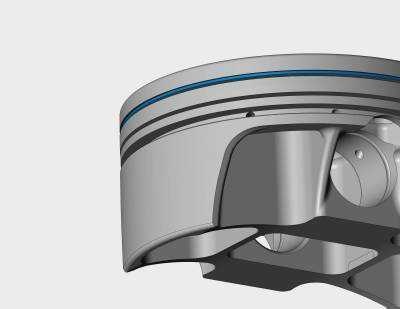 These are generally used on 4 valve pistons and the compression height is generated from this cut. Tulip Pocket(s) Valve reliefs that have a protrusion in the center of the valve pocket to match the underhead shape of the valves. This helps when max compression is the goal. 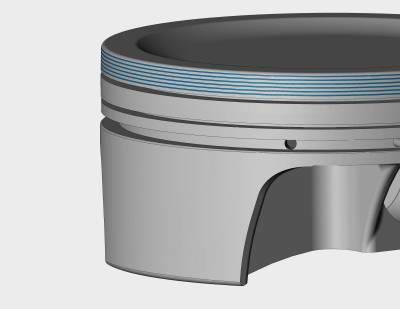 Vertical Gasports Vertical holes from the deck of the piston to the back of the top ring groove which allow combustion pressure to directly enter the top ring groove area for maximum ring seal. When not under load, the ring has normal tension for reduced friction. These are most commonly used for drag race applications. 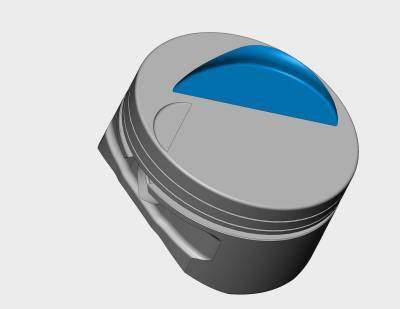 VR Sweep Swept valve reliefs relieve fuel puddling and shrouded valves for a better fuel curve and allow the engines operation to improve during the overlap stroke.